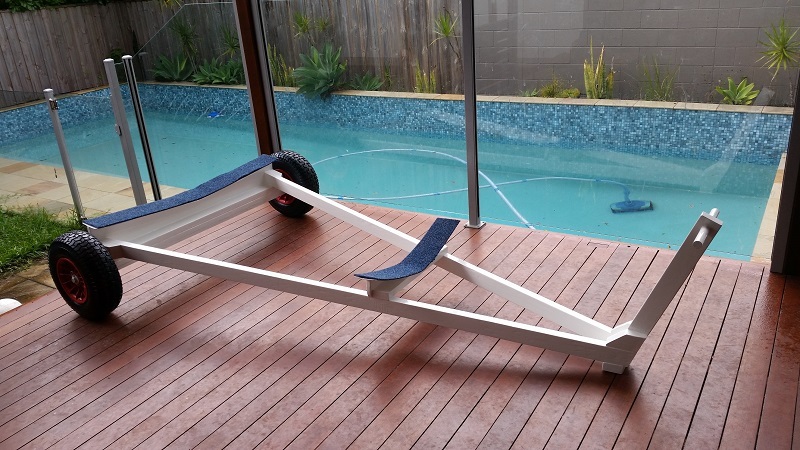 Before I started to build my first dinghy launching trolley (dolly), I scoured the internet for design ideas. One thing was evident — people make do with some really dodgy launching trolleys! This view was backed up by walking around the launching area of my local sailing club when all the boats are out on the water and the trolleys are left on the beach. There are some truly awful dinghy launching trolleys in use! A simple, sturdy and functional launching trolley makes using my boats so much easier and more pleasurable. I hope that by sharing this information, I can help others to enjoy their boating more too. I own six boats with various launching trolley/dolly designs. I have also built two wooden launching trolleys, with a third in production and a fourth trolley on order (I am building it as a favour for someone at our local sailing club). Based on my own trial and error, I have a few ideas on how to refine my dinghy launching trolley design further. My second boat launching trolley built for a Sabre sailing dinghy is described in some detail on this page. Epoxy glue — epoxy mixed with a suitable filler to form epoxy glue has proven to be a good way to construct the frame. Given that this method is used to construct boats, it should also work for wooden launching trolleys. Using epoxy eliminates all metal fastenings (screws/nuts/bolts) that would be prone to rust. A-frame design — sufficiently strong without too much weight. It would be difficult to provide sufficient bracing for the forward bunk if it was mounted on only one length of wood (such as used on a T-style frame). Handle bracing — the joint between the handle T-piece and the A-frame rails takes all of the pushing and pulling forces of the trolley. I think this joint is overbuilt, but I want it to be strong. Handle — the 25 mm dowel handle is okay, but you might want to make it 30 mm for larger hands. Axle case — the axle case has proven to be a strong, reliable and easy way to attach the axle without using metal fittings that can rust. I think that I can use lighter pieces of wood in the future to build the axle case. Bunks — the fibreglass bunks have proven to be sufficiently strong and easy to build. I can stand on them (75 kg with a point load) without any issue. The 18 mm marine plywood bunk supports are sufficiently strong. Wheels — the poly rim hub wheelbarrow wheels have a 180 kg load rating for each wheel and came with plastic bushes (to replace the roller bearings) for use in wet environments. The wheels will not rust and are sufficiently strong. I recommend using the widest wheels possible if the launching trolley is intended to launch heavy boats over soft sand. Aft bunk supports most of the boat weight — with my previous launching trolley design, the aft bunk supports most of the boat weight, with the remaining weight supported on the forward bunk. I would like to balance the weight distribution better, without loading up the trolley handle with too much weight. Forward bunk support bracing is over built — for my 41 kg hull Sabre sailing dinghy, the additional brace for the forward bunk support is not required. The brace also makes it difficult to adequately finish the joint between the brace and the bunk. Axle aluminium rod/bar — I used solid bar to help weigh down the back of the trolley. I think this is not necessary and would prefer to have a lighter trolley. The trolley is overbuilt — lighter wood stock could be used for the weight of my boat. Based on the above lessons learned, I have revised my trolley design. I have not had a chance to build this design yet, but based on my experience with my first three trolleys, I do not see any issues. Note that building techniques are all outlined on this page, with only the updated design changes discussed below. For future builds, I would simply attach the forward bunk support to the frame rails by epoxy gluing it in place with a large fillet and overlaid by one or two layers of 420 gsm double bias fibreglass tape. Based on my lessons learned, I would like to balance the weight better between the forward and aft bunk so that the boat is better supported on the trolley. In my original design, the aft bunk and axle case are laminated together, so moving the aft bunk towards the transom would also move the axle aft and lead to unacceptable weight at the trolley handle. While some people solve this weight issue by placing a small wheel at the front of the trolley, this is not a good solution, particularly if the trolley is to be pulled across soft sand. I have owned two trolleys constructed in this manner and they are absolute pigs to move across soft sand! 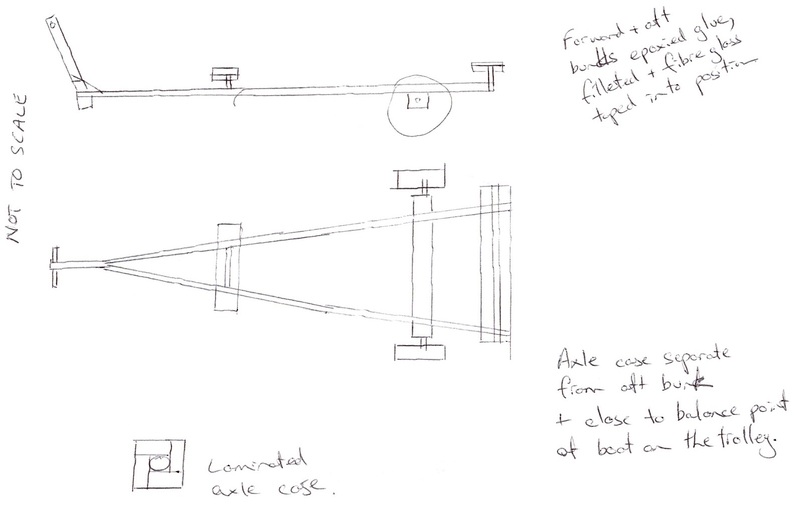 A better solution is to separate the aft bunk and the axel case as per the following sketch (better sketch to come). Find the balance point of the boat fore and aft by gently placing the boat on a piece of wood and moving it fore and aft until the balance point is found. The aft bunk should be around 1/3 to 1/2 the distance from the balance point to the transom of the boat. Build the A-frame, handle and bunks. Build the axle case but do NOT attach it to the A-frame. Place the axel case under the trolley and then place the boat on top of the trolley. Move the axle case fore and aft under the trolley/boat until you find a position where the weight at the handle is acceptable. I think I would aim for about 10-12 kg at the handle (use your bathroom scales to measure the weight at the handle). Mark the location for the axle case and then remove the boat. Epoxy the axle case in the correct position under the trolley A-frame. Replace the solid aluminium bar/rod axle with an aluminium tube of suitable dimensions. My view is that this trolley is overbuilt for my boat which has a 41 kg hull plus mast, sails, etc — probably 55 kg maximum. I have used 70×35 mm MGP10 structural pine for the A-frame and 18 mm marine plywood for the bunk supports. I have been looking for some lighter timber stock for the A-frame, but have not yet sourced some suitable timber. If I can find the right length timber but too small in cross-section, then epoxy gluing/laminating two smaller pieces of wood together to make the right sized timber may be a practical and easy solution. The next smaller sized marine plywood from my local hardware store is 12 mm, which I think is probably too thin. If I could source 15 mm marine plywood, I think that would be okay. Laminating a 6 mm sheet of marine plywood to a 9 mm sheet would get the same result. For the weight and hassle, I think I will probably stick with the 18 mm plywood.